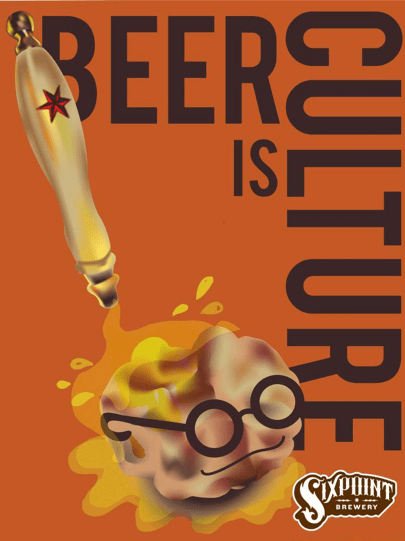 Daniela’s entry in Beer Is Culture sort of blew our minds. This is exactly how we feel on Sunday mornings, too. Originally from Caracas, Venezuela, Daniela came to New York for college and now works in graphic design and resides in Brooklyn. Here are some of her thoughts on her work and the universality of beer. DSR: Living in Belgium for a year probably changed the impression I had on beer as an essential part of our culture. Beer has an immense potential to bring people together, whether it is in its production or its consumption. I witnessed locals, foreigners, people from different social statuses, folks with different ideologies, young and old bonding over a good glass of their beer of choice. It was then that I realized that beer has probably served for years as the fuel that has allowed great ideas to arise. Think about how many meetings, brainstorming sessions, decision making, creative pursuits and many other things were accompanied by some hops, malts, yeast and water in perfect harmony! Therefore I designed a brain happily taking in its favorite Sixpoint right off the tap handle, probably coming up with some fantastic ideas. Also, I believe I was having a Crisp while sketching, so that influenced the design as well. I’m not encouraging alcohol consumption to enhance creativity, but a good beer, with good people, there’s now way your creative self will not be inspired! DSR: I’ve always been interested in design, but my formal training begun quite recently. I’m currently in my third semester in Graphic Design at the New York Institute of Technology. I began exploring computer based illustration this semester and I thought the Sixpoint exhibit would be a great chance to practice the skills acquired. DSR: We all go through the same creative process. Most computer based artists begin their ideas on paper: sketching, laying out, experimenting and trying different approaches. Also, having the computer doesn’t mean the work will be done for you. Most succesfull computer artsits have an background in more convential art forms that helps their work shine. So having knowledge in drawing, sculpting, painting, color theory, different mediums and materials is always extra useful to avoid your work looking machine made and to leave your mark as an artists in the computer as much as in the canvas. DSR: Union, I think that would be the first word that comes to my mind. As I explained before, it’s the ability to bring people from diverse backgrounds together that never ceases to impress me.